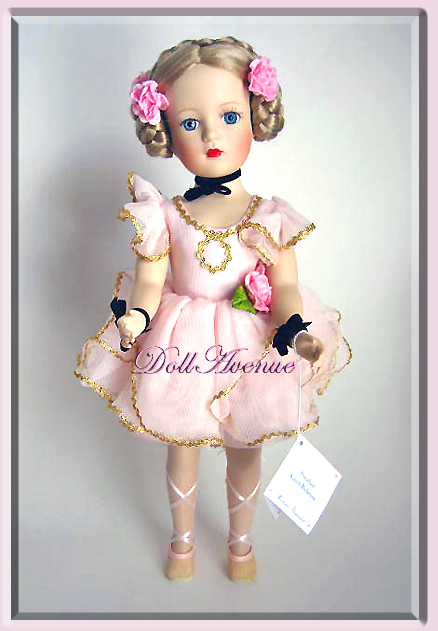 15" Porcelain Karen Ballerina #90200 is a 1999-2000 reproduction of the 1940's doll. Karen has an exquisite porcelain face with vivid blue eyes and long life-like eyelashes, rosy cheeks and ruby lips. Her blond hair is styled in two braided side buns decorated with pink fabric roses and a single braid over the top of her head. Karen is dressed in a soft pink netted ballet costume trimmed in gold and decorated with matching pink roses, pink sheer tights and laced ballet slippers. She has black velvet ribbons tied at her wrists and neck and comes with her hand tag. This beautiful, previously owned Karen Ballerina will arrive in beautiful condition, with hand-tag and original box (paper wrapping inside the box is torn).